The scientific imaging of works of art is crucial for the assessment of the presence and distribution of pigments and other materials on surfaces. It is known that some ancient pigments are luminescent: these include pink red-lakes and the blue and purple pigments Egyptian Blue (CaCuSi4O10), Han blue (BaCuSi4O10) and Han purple (BaCuSi2O6). Indeed, the unique near-infrared luminescence emission of Egyptian blue allows the imaging of its distribution on surfaces. We focus on the imaging of the time-resolved photoluminescence of ancient Egyptian objects in the Burri Collection from the Civic Museum of Crema and of the Cremasco (Italy). Time-resolved photoluminescence images have been acquired using excitation at 355 nm for detecting the ns-emission of red lakes and binding media; by employing 532 nm excitation Egyptian blue is probed, and the spatial distribution of its long-lived microsecond emission is imaged. For the first time we provide data on the photoluminescence lifetime of Egyptian blue directly from objects. Moreover, we demonstrate that the use of a pulsed laser emitting at two different wavelengths increases the effectiveness of the lifetime imaging technique for mapping the presence of emissions from pigments on painted surfaces. Laser-induced luminescence spectra from different areas of the objects and traditional digital imaging, using led-based lamps, long pass filters and a commercial photographic camera, complement the results from photoluminescence lifetime imaging. We demonstrate the versatility of a new instrumental setup, capable of recording decay emission kinetics with lifetimes from nanosecond to microseconds. While the combined wavelength approach for the imaging of emissions from different materials has been demonstrated for the study of ancient Egyptian pigments (both organic and inorganic), the method could be extended to the analysis of modern pigments and paintings. The imaging of paintings and painted objects relies on the interaction between radiation and matter and the detection of reflected or emitted photons. Technical examination and analysis of works of artworks typically relies on the integration of non-invasive imaging and suitable spectroscopic analysis, often followed by taking and analysing samples. In this work we report an imaging study of Egyptian objects with a novel portable setup for time-resolved photoluminescence (TRPL) imaging and spectroscopy, with a focus on the analysis of Egyptian Blue and lake pigments on artefacts. Photoluminescence (PL) of pigments and paint has received significant attention due to its practical use in the assessment of the condition of works of art: for example, aged organic varnishes may appear more luminescent than freshly applied paint and some pigments, including semiconductor materials, emit characteristic PL signals . Among ancient Egyptian pigments, Egyptian blue and madder-based red lakes are luminescent and are routinely identified with the aid of microscopic and spectroscopic analysis . While the fluorescence observed in madder lakes is due to the anthraquinone molecules purpurin and alizarin, the optical emission of Egyptian blue has been ascribed to Cu2+ in a solid calcium-silica matrix [3–5]. Recent research on the mineral pigment has reported that synthetic cuprorivaite has a radiative emission with a maximum peaked at 910 nm and a lifetime of 107 μs and a quantum yield of 10 % . The imaging of PL from painted surfaces is often carried out to detect the colour of the emission, for which various approaches have been suggested. Whereas ultraviolet (UV) light sources based on Mercury lamps require filtering of spurious radiation emitted in the visible to render them useful for imaging and photography, innovative uses of Xenon-flashes and digital photography have demonstrated the peculiar and noteworthy infrared emissions from Egyptian blue on paintings and painted objects from the British Museum and, more recently, on Fayoum Portraits [7–9]. Many other examples of digital imaging of Egyptian blue from objects have been documented. In addition to digital photographic imaging, PL spectroscopic imaging techniques have found multiple applications for the analysis of paintings, including those carried out with a scanning Lidar approach [10, 11] and with light emitting diodes (LED) . With these methods, the detection of PL can be carried out with imaging spectrometers or suitably filtered imaging detectors [13, 14]. Another approach to the imaging of the PL from works of art relies on the detection of the emission lifetime, which can be achieved by combining pulsed laser excitation with a time-gated imaging detector, known as fluorescence lifetime imaging or, more generally, TRPL Imaging . 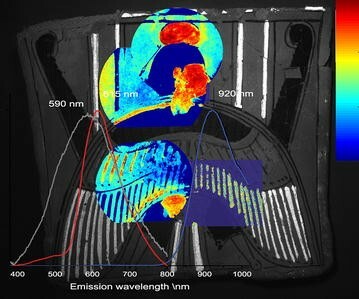 Applications of TRPL imaging for the detection of organic materials on stone sculptures , wall paintings , and semiconductor pigments on paper  have been published, and demonstrate how TRPL imaging can map the chemical composition of surfaces based on significant differences in emission lifetime. In previous applications a ns Q-switched Nd:YAG laser emitting at 355 nm was employed as this wavelength can excite emissions from binding media and organic polymers and aforementioned fluorescent pigments. In this work we have modified our TRPL imaging set-up by adding excitation at 532 nm from the same Nd:YAG laser to allow the excitation of Egyptian blue. The combined wavelength approach has been applied to the imaging of painted objects from Carla Maria Burri Collection in the Civic Museum of Crema and the Cremasco (see sample description). Complementary laser-induced PL spectroscopy from selected points on the objects has been carried out and digital photography using LED excitation complement images acquired with TRPL imaging. Preliminary PL spectroscopy analysis of a model sample painted with the commercially available Egyptian blue pigment reveals a characteristic emission spectrum with a maximum emission at 920 ± 6 nm and a mono-exponential emission lifetime of 138 ± 4 µs (95 % confidence) (Fig. 1), in good agreement with the spectral data reported by others from pigments from the same supplier [7, 19]. The emission lifetime measured in our commercial pigment is in agreement with Borozov et al. but differs with respect to that reported for the synthetic mineral calculated using single photon counting and 637 nm excitation (τ = 107 μs ). It is possible that the discrepancy in the PL lifetime is due to grinding of the pigment rather than to differences related to the methods used for the estimation of the PL decay . PL imaging of the ancient Egyptian cartonnage (Fig. 2a) reveals the presence of different luminescent painted areas, effectively probed with the two lamp-based excitations: following UV-excitation (Fig. 2b) an orange emission on red-pink areas and an intense bluish emission in white areas are observed. Conversely, excitation in the green and following inspection of the emission in the near-infrared reveals the use of an infrared luminescent pigment in most, but not all, of the areas painted with dark colours (Fig. 2c). Some of the areas painted dark are black and do not contain luminescent pigments. Results of PL spectroscopy of a dark painted area following excitation at 532 nm (point 3 in Fig. 2a), is clear evidence of the use of the Egyptian blue pigment, as the detected emission spectrum closely resembles that of the Egyptian blue model sample (Fig. 3). TRPL imaging of details of the cartonnage painted with some of the dark colours reveals a monoexponential microsecond decay kinetic with a mean lifetime in the analysed area of 119 µs (7.7 µs interquartile range) and a negative skewness of −3.04, a reflection of the distribution of lifetime values that tend to be shorter than the mean (Fig. 4b). UV-induced optical emission of the cartonnage is associated with a nanosecond decay kinetic, typically ascribed to emission from organic molecules: following analysis of the first ten nanoseconds of the emission decay profile, red-pink painted areas, white painted areas (as the face and the decorative heat) and the yellow painted background have an effective lifetime close to 3.4, 3.8 and 3.1 ns, respectively (Fig. 4). Although the reconstructed lifetime values differ by hundreds of picoseconds, the lifetime map allows the rapid discrimination between the different painted areas, suggesting the presence of different organic pigments and binders. Specifically, the emission spectrum recorded on the red-pink painted areas (point 1 in Fig. 2a), peaked at 615 nm, resembles the spectral features of a red lake pigment, likely madder-based [4, 20] (Fig. 3). The broad spectrum recorded in the white painted area, with an emission peak at 590 nm, (Fig. 3) suggests the presence of a complex organic material, and is ascribed to emissions from binding media . TRPL imaging of the stone mask, following visible excitation, suggests the presence of traces of the Egyptian blue pigment for decorating the areas of hair, beard and irises of the eyes in Fig. 5. Blue used to paint the irises in polychromy has also been reported by Verri . The clear identification of Egyptian Blue has been achieved through PL spectroscopy on a point on the hair of the mask: an emission spectrum comparable to that recorded on the commercial sample of Egyptian blue was recorded (data not shown). In terms of lifetime analysis, these painted areas show a microsecond decay kinetic close to that found from details on the cartonnage painted with Egyptian blue: here, we have detected a mean lifetime of 121.3 µs (6.6 µs of interquartile range) and a negative skew of −2.79 (Fig. 5). The dual wavelength-excitation PL lifetime imaging approach reported here for the first time has been demonstrated to be valuable for probing the optical emission of different materials, of organic and inorganic nature, for the study of Ancient Egyptian artefacts. The same approach could be extended to the analysis of modern pigments and paintings, allowing an in-depth investigation of the emission properties of organic and inorganic artist materials, including Cd-based pigments, in a combined way [13, 21]. Whereas the PL properties of the naturally occurring cuprorivaite mineral have been widely investigated in terms of both spectrum and decay kinetics [3, 6] and its brilliant emission has been exploited for the rapid detection of the presence of the pigment in artworks from the Ancient Egypt , the near-infrared emission in Egyptian blue-painted ancient objects is not completely understood . The intense and long emission recorded with PL imaging which is on the order of 120 μs is nonetheless diagnostic for the presence of Egyptian blue. Differences in lifetime in objects with respect to that reported and detected from that of the pure mineral and the synthetic commercial pigment are noted. The reasons behind lifetime differences are beyond the scope of this work and require more refined analysis. Research in the future should address different degrees of crystallinity of the pigment in ancient objects following ancient synthesis processes, grinding or sintering of the pigments and determine if chemical interactions between the pigment and the surrounding matrix in objects affects the emission lifetimes. Further analyses with complementary methods sensitive to impurities which could account for differences in lifetime would be required to better refine these hypotheses. The antiquities collection of the late Carla Maria Burri (1935–2009), Director of the Italian Cultural Institute in Egypt from 1993 and 1999, was donated to the Museo Civico di Crema e del Cremasco in Winter 2010/2011 . In 2013, Christian Orsenigo was charged with the study of the artefacts, under the supervision of Dr. Francesco Muscolino of the Soprintendenza Archeologia della Lombardia. The collection consists of about eighty objects and covers a vast time span; ranging from the most ancient item—a faience tile once belonging to the decoration of the walls of the galleries underneath Djoser’s Step Pyramid at Saqqara (ca. 2630–2611 B.C.E. )—excluding some flints actually under study—to Islamic glass dating to the 11th C. (Orsenigo 2016, forthcoming). The collection includes objects belonging to different typologies, such as funerary statuettes (shabtis) from the late New Kingdom, masks and parts of sarcophagi, bronzes and amulets, other than Hellenistic and Roman terracotta figurines and lamps. In this work we examine a Cartonnage and a Mask. Even if preserved only in its upper front part, the object is likely a miniature painted terracotta comic mask of an actor playing a slave character in the New Comedy. It shows a broad nose, brows flying up to the sides and wrinkled forehead. It can be dated to the Ptolemaic Period. See references for comparisons with similar objects [25, 26]. A painted model sample of Egyptian blue pigment (Kremer pigmente, GmbH) was prepared and analysed. The pigment, dispersed in Plextol, was applied as a painted layer on a glass substrate. The TRPL imaging device is, described in detail elsewhere, and is summarized below. A schematic diagrame of the setup can be found elsewhere . The device is comprised of a ns laser excitation source combined with a time-gated intensified camera (C9546-03, Hamamatsu Photonics, Hamamatsu City, Japan), capable of high speed gating to capture images of transient phenomena. A custom-built trigger unit and a precision delay generator (DG535 Stanford Research System, Sunnyvale, CA, USA) complete the system, which has a net temporal jitter close to 0.5 ns. The Q-switching laser source (FTSS 355-50 Crylas GmbH, Berlin, Germany), based on the third harmonic of a diode-pumped Nd:YAG crystal (λ = 355 nm, Pulse energy = 70 μJ, Pulse duration = 1.0 ns, repetition frequency = 100 Hz), has been modified in order to obtain the second harmonic of the same source emission (λ = 532 nm, Pulse energy = 60 μJ, Pulse duration = 1.0 ns). By using both wavelengths we probe the PL emission of materials with different absorption spectra. The two emission lines of the laser source are collinear; hence it is easy to switch between them during measurements. In order to spectrally clean laser emissions, proper bandpass filters (FL355-10 or FL532-10, Thorlabs GmbH Germany) are employed at the exit of the laser source. The laser beam, coupled to a silica optical fibre, is magnified with suitable silica optics in order to illuminate a circular area of about 25 cm diameter on the surface of the object, with a typical fluence per pulse below 140 nJcm−2. This very low power density does not lead to detectable changes in the intensity of emission due to photooxidation in samples following typical measurements. The kinetics of the emission is detected by the gated intensified camera, which is based on a GaAs photocathode with spectral sensitivity from 380 to 900 nm. The gate width of the camera is adjustable from 3 ns to continuous mode, depending on the kinetic properties of the surface under investigation. In this work a gate width of 5 ns was employed to detect the nanosecond kinetics of the emission from organic materials. Long-lived decay kinetics ascribed to emissions from areas painted in Egyptian blue have been effectively sampled by increasing the width to 100 µs. A proper optical highpass filter w placed in front of the camera lens in order to remove excitation light: the B + W UV/IR Cut 486 M MRC filter (Schneider Optics), with high transmission from 380 to 720 nm, was employed for lifetime analysis following 355 nm excitation, whereas the Kodak Wratten 23A filter transmitting light beyond 550 nm was employed for measurements at 532 nm excitation. As has been shown in previous research, the short temporal jitter of the system is key to the estimation of ns lifetimes which may be used to differentiate organic binding media and pigments . TRPL imaging is achieved through the reconstruction of the effective lifetime map based on a simple mono-exponential decay model . A compact spectrometer and the same dual-wavelength laser source employed in the TRPL imaging device were used for detecting emission spectra from selected points on objects. The compact spectrometer (TM-CCD C10083CA-2100, Hamamatsu Photonics) mounts a back thinned CCD image sensor and a transmission-type grating, recording spectra between 320–1100 nm with a spectral resolution of 6 nm. Through fibre optics both the laser and the spectrometer are remotely connected to an optical probe, working in the 45–0° configuration mode. Proper transmission high-pass filters (FEL420 or FEL550, Thorlabs GmbH Germany) are mounted on the probe which, that allow excitation and collection of photons from a point on surface of approximately 1 mm diameter at a distance of 35 mm. The probe is equipped with a proper transmission high-pass filter (FGL420 or FELH550, Thorlabs GmbH Germany) depending on the employed laser wavelength. Spectra are reported following background subtraction (mainly related to the sensor read and dark noise) and correction for the spectral efficiency of the device. As proposed in past research [7, 8], a commercial Nikon D7100 digital camera (D60) was employed for recording UV-induced digital images of the PL emission of objects. Excitation was provided from a Xenon-based flash equipped with an UV bandpass filter (DUG11, Schott AG), whereas a transmission filter blocking light in the UV and in the NIR spectral range (W UV/IR Cut 486 M MRC filter, Schneider Optics) was mounted in front of a 50-mm focal camera lens [7, 8]. Similarly, infrared digital photography of the emission of Egyptian Blue painted objects was performed using the commercial digital camera without the infrared blocking filter (supplied by Advanced Camera Services, UK) and mounting an). An infrared transmission filter (R72, HOYA) was placed in front of the camera lens  for detection only of the infrared emission. Excitation of PL emission was achieved using a 15 W Watt green LED-based lamp with emission in the green (4000 lx @ 1 m) (FLAT PAR CAN RGB 10 IR WH, Cameo (Germany)). Analysis was carried out by DC, AN, VC and SM. Historical context and information has been provided by CO. All authors read and approved the final manuscript. Research was partially funded through the Bilateral Project between Italy and Egypt coordinated by Daniela Comelli (Politecnico di Milano, Italy) and Abdelrazek Elnaggar (Univeristy of Fayoum, Egypt) (Progetti di Grande Rilevanza, Protocollo Esecutivo–EGITTO, PGR 00101.) Authors thank Daniela Gallo Carrabba and Fiorenzo Gnesi (Associazione Carla Maria Burri), Francesca Moruzzi and Simone Riboldi (Museo civico di Crema e del Cremasco), Francesco Muscolino (Soprintendenza Archeologia della Lombardia) and Patrizia Piacentini (Università degli Studi di Milano, Chair of Egyptology). Petrie museum. http://petriecat.museums.ucl.ac.uk/. Accessed 1 Dec 2015. British museum collection database. http://www.britishmuseum.org/research/collection_online. Accessed 1 Dec 2015.